Two runners for the stable on ANZAC day with Milwaukee at Flemington and Bonnieux at Randwick. Bonnieux is the first to go in race one at Randwick, the Light Horse Brigade 3YO Maiden Plate over 1400m where she will be ridden by Tim Clark and jump from barrier three. The daughter of Choisir has raced four times this preparation and Mike Moroney is conscious of her constitution. “It took her a little while to get over her last run and she finds herself in a strong enough maiden,” Moroney said. “She’s done well this preparation but I’m a little wary she might be starting to feel it a bit. Milwaukee (pictured) runs in the last race of the day at Flemington, the ANZAC Appeal Handicap over the straight 1200m with Jack Martin claiming and drawn barrier 10. The four-year-old will be sporting the ANZAC khaki colours and last ran on April 18 when fifth at Caulfeld on a track that came up soft(6). 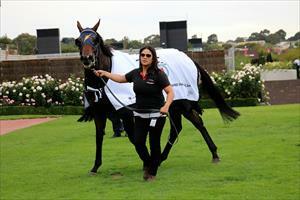 “We’ve kept him fresh for this and he’s done a lot of swimming and trotting,” Moroney said. "Win, lose or draw I’m thinking he heads to the paddock after Wednesday. “If the track stays as it is on the firmer side then I think he can turn the form around from last start - I just think that bit of rain at Caulfield made the difference for him.